The herbal supplement, Amrit Kalash, was developed thousands of years ago by the great Ayurvedic sages as the one formula for total health. Instead of treating symptoms of disease, Ayurvedic wisdom offered Amrit Kalash as a natural, holistic approach to help root out the underlying cause of disease. Amrit paste (MA4) is especially good for the mind, brain and nerves. Also promotes vitality and inner strength. All-natural, pesticide-free blend of 13 traditional herbs. Amrit Kalash is a combi-pack of 600 gms Herbal Fruit concentrate (Nectar) and 60 Herbal tablets (Ambrosia) - MA4 and MA5. The Nectar herbal fruit concentrate and Ambrosia herbal tablets work together to create overall health. They contain different ingredients but have complementary effects. This ancient Ayurvedic herbal supplement is known to provide balance and strength to body’s immune system by protecting the body against free radical damage. Ayurvedic experts say that Amrit Kalash contributes to the state of bala — a state where the body’s own ability to defend itself is at its optimum. Rasayana means "that which supports Rasa." Rasa corresponds to plasma and nourishes the whole body. Where single herbs can be dangerous, Rasayanas are complex combinations that include natural antidotes and herbs that are "best friends." The result is a synergistic combination (Amrit Kalash) much more powerful than the sum of the effects of the individual herbs. Free radicals produced in the body by normal bodily processes and especially by mental and physical stress, environmental pollution and pesticides in foods can cause extensive damage in all cells, speed up the ageing process and contribute to a wide range of diseases. A diet rich in fresh fruits and vegetables supplies a good amount of anti-oxidants that mop up the damaging free radicals. Comprehensive scientific research has shown that Amrit Kalash is the most effective known food supplement to ensure you have an adequate anti-oxidant supply. Maharishi Amrit Kalash (MAK) helps maintain the health and functioning of the entire physiology - it increases longevity, memory and intelligence, enhances immunity, elevates energy levels, decreases the effects of aging and enhances overall well-being. Amrit Kalash is the most powerful of all known Ayurvedic supplements, which gives the energy no other supplement can give. It is soluble in both water and fats and can thus be active throughout the body - in the blood stream and inside the cells. The latest research shows that one gram of Amrit kalash is more effective against free radicals than 1,000 grams of vitamin C or E. It takes 250 meticulous steps to prepare. Twenty-two pounds of raw ingredients are required to produce a single jar of the Amrit Nectar. The herbs are slow-cooked to protect vital nutrients from high temperatures. This precise adherence to tradition and detail ensures that you get an authentic product of unparalleled quality. Amrit Kalash is and Ayurvedic Herbal Masterpiece and a true gift to the world! 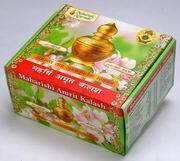 One box of MA4 (600g Amrit paste) and MA5 (60 Tablets) comprising 1 months supply of Maharishi Amrit Kalash. Not only is Amrit delicious but it has an amazing strengthening effect on the body - we prefer taking it with fresh organic milk. This product was added to our catalog on Sunday 16 April, 2006. Not only is Amrit delicious but it has an amazing strengthen ..